There is more sad news this Thursday morning. Ida McBride Kerfoot, Class of 1933, passed away in Richmond on Tuesday, December 06, 2011 at the age of 96. 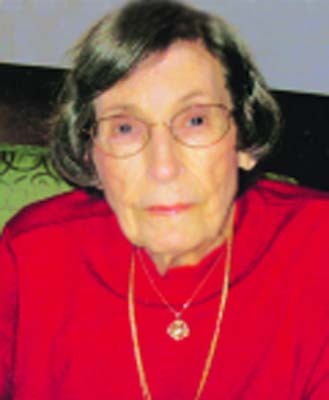 NEWPORT NEWS - Ida McBride Kerfoot, 96, passed away Tuesday, Dec. 6, 2011, in Richmond. Ida was a lifelong Peninsula resident. She retired from Newport News Shipbuilding and Dry Dock Company, M.I. Department after more than 20 years of service. She was a life member of First Presbyterian Church and current member of Hidenwood Presbyterian Church. She was a graduate of Newport News High School, class of 1933. She is preceded in death by her husband, George Chapin Kerfoot Jr. Survivors include a daughter, Elizabeth K. Power and her husband, Tom, of Midlothian; two grandsons, Grey Power of Midlothian, Michael Power and his wife, Nadenna of Lanett, Ala.; three great-grandsons, Harper, Zade, and Brheady Power of Lanett; one sister, Edith Nichols of Newport News; sister-in-law, Betsy McBride of Smithfield; and numerous nieces and nephews. A graveside service will be held at 11 a.m. Friday, Dec. 9, at Peninsula Memorial Park with the Rev. William G. Lamont officiating. In lieu of flowers donations may be made to the . Our deepest sympathies are extended to Mrs. Kerfoot's family and friends at this time. still 'tis his hand that leadeth me. since 'tis my God that leadeth me.